SPOT 2 Satellite GPS Messenger provides a vital line of communication with friends and family when you want it, and emergency assistance when you need it. Using 100% satellite technology, SPOT 2 works virtually anywhere in the world, even where mobile phones don’t – all with the push of a button. SPOT 2 works around the world, including virtually all of the continental United States, Canada, Mexico, Europe and Australia, portions of South America, Northern Africa, and North-Eastern Asia and hundreds or thousands of miles offshore of these areas. 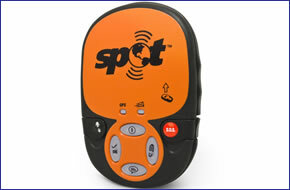 SPOT 2 Satellite GPS Messenger has been discontinued. SPOT 2 Satellite GPS Messenger has been replaced by the SPOT Gen3. SOS: Use this function In the event of a life threatening or other critical emergency to notify emergency services of your GPS location and that you need assistance. The GEOS International Emergency Response Center alerts the appropriate agencies worldwide - for example contacting 9-1-1 responders in North America and 1-1-2 responders in Europe. Custom Message: This feature allows you to let your friends and family know receive a custom message along with your GPS location with a push of a button. Use this feature as a secondary OK message or transfer your personal help alert to this message function if you are using a SPOT Assist service on your Help button. Share tracks, photos, stories and updates of your adventures with friends, family and other SPOT 2 users. With SPOT 2 Adventures, you can share your adventures easily at spotadventures.com. Register your SPOT 2 device and enjoy the benefits of a new online community. We provide a full social portal that allows you to share GPS location data from your SPOT 2 device in near real-time via a SPOT 2 Live Map. Save your adventures easily on a detailed map of your trip accompanied by photos and a personal blog. You will have your own personal profile and social portal to keep track of all your amazing SPOT 2 experiences. SPOT 2 works around the world, including virtually all of the continental United States, Canada, Mexico, Europe and Australia, portions of South America, Northern Africa, and North-Eastern Asia and hundreds or thousands of miles offshore of these areas. In Russia, the GPS accuracy of your SPOT 2 is limited (degraded) in accordance with Russian regulations restricting the accuracy of GPS performance for devices utilised in Russia. Unlimited Check-in/OK, Help, and Custom Message emails are included. Up to 200 annual Check-in/OK, Help, or Custom Message text messages to any mobile phone, worldwide, are also included in the plan. Your credit card on file will be charged €0.10 for each additional text message.